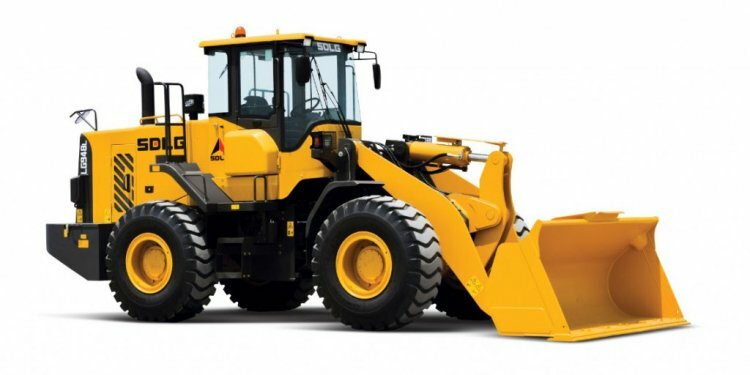 Wheel loader is a piece of construction machinery that is equipped with a front mounted bucket. Bucket is supported by a boom structure. Wheel loader load material into the bucket by means of forward motion of the machine and then lift it. After that it transports at respective destination and now loader release the material. Wheel loader has an articulated body i.e. a hinge between the front and the rear assembly. It has two axles like articulated grader. It is fully hydraulic control. Wheel loaders are used are multi-purposes like, for loading trucks with materials such as earth and rocks. It has also a capability of earth excavation. Wheel loader is economical as compared to excavator and bucket dozer in a sense of efficiency, capacity of bucket and speed. Wheel loader has speed as well as long hauling distance. Hauling distance is the distance up to which machine is able to carry material keeping in view the economy. During loading wheel loader keep the bucket position flat on the ground and moves the machine in forward direction until bucket become fully loaded. After fully bucket penetration in to the heap, the operator raises the bucket and tilts it with the help of controlling lever. Now for unloading, wheel loader approaches the dump truck at its right angle. Now when bucket is above the dump body of dump truck, slowly unload the bucket. And at the end shake the bucket so that all material leaves the bucket. During loading approach the heap at right angle so that complete bucket get penetrate. If surface is like a semi-circle then in this case first approach the two ends. After that heap shape become almost rectangular and now approach the heap at it center keeping machine at its right angle. Leveling is done by spreading soil during reversing of machine.